Theo Walcott emerged from the substitutes' bench to score one goal and set up another as England earned a 3-2 victory over Sweden, who were eliminated from Euro 2012after an enthralling game in Kiev. Roy Hodgson introduced Andy Carroll to the Three Lions starting XI and the decision paid dividends when the Liverpool striker sent England into a first-half lead with a powerful header. Sweden, however, improved dramatically after the break and after Glen Johnson failed in his attempt to keep Olof Mellberg's finish out, the Olympiakos defender headed home a second to put Erik Hamren's team in front. But Walcott made all the difference when England seemed to be crumbling, levelling the score with a 25-yard volley before laying on Danny Welbeck's outstanding winning goal. England entered the match at a good tempo and with a surprising amount of positivity. Ashley Cole was not afraid to drive deep into the Swedish half and defensive midfielder Scott Parker found himself high enough up the pitch to test Andreas Isaksson for the first time with a powerful shot from 25 yards. pace let him down at the end of two promising excursions towards Joe Hart's goal. As had been the case in seven of their eight matches prior to this encounter, aerial play proved to be Sweden's undoing. Having whipped in the free kick from which Joleon Lescott scored against France, Steven Gerrard fired a fine long pass from an almost identical position that Carroll thundered home with a superb header. Kim Kallstrom rifled an effort narrowly over the bar but Hart survived the first half without being severely tested while at the other end, Ashley Young was set free by Cole but failed to take advantage of the Chelsea full-back's smart one-touch pass and could only scuff a shot that trickled into the side netting. It took Ibrahimovic less than four minutes to lay on Sweden's equaliser after the break but this was one assist he could not take too many plaudits for. Having failed to beat the England wall with a free kick from 25 yards out, the Serie A top scorer inadvertently sliced the rebound straight into the feet of Mellberg, who swept a left-footed effort shot past Hart that Johnson could only clear off the line and on to the inside of the post, with the ball subsequently bouncing back into the net. Johnson had failed to push up after the initial set-piece had been repelled, playing Mellberg onside, and as they did against France, England retreated too deep in response to the Swedish pressure. Johnson recovered well to prevent Rasmus Elm from running through on goal but the panic did not end there. Larsson sent a long free-kick deep into the England box and with Johnson and Lescott left beaten by the men they had attempted to mark, Mellberg rose to head beyond Hart from point blank range. Hodgson's response was swift and quickly paid off. Walcott entered the fray in place of James Milner and after a Gerrard corner from the England left-hand side was weakly cleared, the Arsenal winger crashed a swerving volley beyond Isaksson from just outside the penalty area. Ibrahimovic came close to grabbing a brilliant third with a thunderbolt of a shot that Hart palmed away but Walcott again proved the difference. 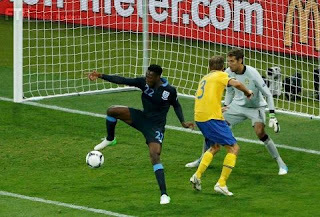 The 23-year-old darted in between two Sweden defenders before lifting a precise cross into Welbeck, who got in front of his marker before beating Isaksson with a sublime flick with his heel. Welbeck's winner ensured Sweden's departure from the competition with one group game, against France, still to play, but England march on and will enter their final first round fixture against Ukraine requiring only a draw to secure progression.